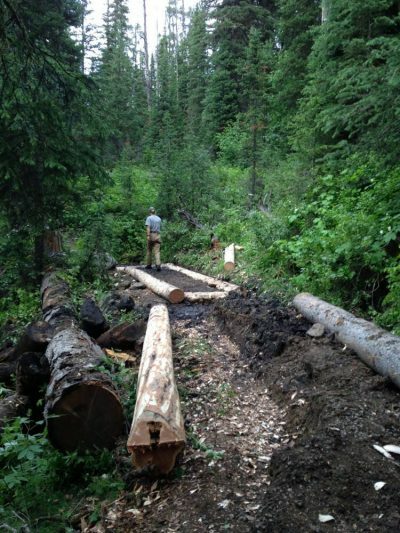 This is the start of the popular “Beaten Path” route from Cooke City to the East Rosebud. If you’ve hiked this trail, you know that the first section of the trail up to Kersey Lake is notoriously boggy. We will work on adding drainage structures and building framed, raised turnpikes through the muddy stretches. We will hike into work every day (up to 2 miles one-way); the altitude is around 7,500 feetand because constructing turnpikes is quite involved, this trip is fairly strenuous. This our only cabin stay and front-country camping trips this season! Because each day we start out at the Chief Joseph/Clark’s Fork Trailhead, you can join us for a portion of this trip if you can’t make the full five days of work. Just make sure you are ready to hit the trail at 8 am! As always, tasty meals are provided. Note: This trip takes place in the heart of grizzly country! We will have access to the historic Forest Service cabin which sleeps six people, and folks are welcome to sleep in their hard-sided vehicles. Tent camping is not allowed. You are about to sign up for The Beaten Path (Cooke City to E. Rosebud) Turnpike Construction 2019. If you want to sign up for another project, please choose your desired project from the overview. Signing up for a project means you can participate for either all or part of a project (please notify us in advance of this). When you finish signing up you will be contacted by the Absaroka-Beartooth Wilderness Foundation to confirm your participation. Until you get a confirmation, there is no guararantee you will be on the project (projects often fill quickly). Your data is treated with care and your privacy is ensured. All traffic is sent over an encrypted connection (HTTPS). Email verification and your privacy To protect your privacy, you'll need to enter your email address below and we'll email you a link. Click on that link to proceed with signing up for this project. Usually emails are sent out blazingly fast, but please allow for a few minutes delay and check your spam/junk folder (and also your "Promotionals" tab in Gmail). Click here to proceed and have the link delivered to your inbox!